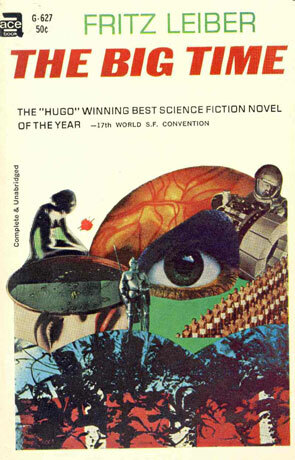 The Big Time won the coveted Hugo award for best novel in 1958 - the fourth novel to win such award; a science fiction story written by an author best known for his fantasy stories. It's unique in style and form, reading as much as a play as it does a novel. This feeling is re-enforced by the fact that the whole book takes place in one single location - that of "the place", a bar and respite for the soldiers that fight in the "time war", part of a collection of stories known as the "Change War". This war describes rival factions who are locked in a bitter, unending battle for control of the Universe and that of humanity. The stage that this war is set upon is all of human history itself where each side alter what really happened time and again until there is no real certainty what the original outcome could have been. The Change War featured a number of stories - The Big Time being just one of these, a story where wounded soldiers, the "place's" Doctors and Entertainers find themselves trapped with a live Atomic Bomb and little hope of escape. The way that Leiber creates a sense of claustrophobia and tension is nothing short of brilliant as is the way that he creates a story that only features a few characters and is all contained within the same room. The book isn't without it's faults though, it shows it's age in the linguistic style which is heavily laden with 50's venacular and even allowing for this some lines are terribly ropey. While this could be seen as unavoidable it does date the book and grates on the reader a little. I'm also not a big fan of reading theatre scripts or plays and the book does read very much like one. Having said that making it structured like a play also provides one of the biggest advantages, that of the "locked room" mystery and reliance on dialogue to convey ideas. I loved the concept of the the "change war", it's a brilliant idea that Leiber makes excellent use of and explores in a remarkably detailed manner given the setting and short length of book - my edition weighs in at a mere 129 pages. I found his ideas of time travel to be quite remarkable given that this was imagined over 60 years ago. The inhabitants of this locked room are largely made up from soldiers of different time periods - A second world war Nazi, a first world war fighter from Passchensale and a Roman legionnaire share space with an octopus shaped alien, barman Sid and a few "good-time" girls (including the narrator Greta Forzane). These soldiers fight for a secretive organisation known as the "Spiders" who fight against the equally enigmatic "Snakes" across time. Mixing up time periods works surprisingly well, making great use of the various character traits of the period although this does mean they are essentially stereotypes, the Nazi being a bad egg for example and then there is the setting of the McGuffin, in the shape of an active atomic bomb - a situation which becomes more serious when the "door" stops working. There is some very effective humour about the ideas of causality and this is highlighted perfectly by the fact that the soldiers exist at all, even though their own timeline no longer exists. There are parts of this book that are pure genius and deserving of every praise and if you can get past the dodgy dialogue and get your brain around causality and time distortions then I would encourage you to seek it out, for all it's brief content it has a great deal of power. Written on 20th August 2013 by Ant.